TITLE: Celebrate Life, Blend With The Landscape. DEFINITION: Book, "The Hopi Survival Kit"
SECONDARY CATEGORIES: Death, Reality, Tribe. RELATIONSHIP TO THE CORE WAVE: Why is the timeless message ignored? Why don't we heed the warning? Why do we rebel against taking good care of ourselves? "The time will come to pass when the minds of men will become deluded and the words of the wise will be ignored." "Signs of change in natural order." "Only through peace the survival of mankind and our planet Earth is possible. Only if we, the human race, are willing to change." "The simple life advocated by Maasaw bears a kind of fruit what we seldom acknowledge. It avoids waste and misuse. It is a great equalizer. It does not take more for itself than is required, or more than its share. there is nothing self-serving or selfish about it. A simple life style will go a long way toward assuring harmony...."
"What the Creator and Maasaw tell us is that human beings the world over must undergo a total change in attitude regarding life and the environment. From the cradle to the grave, we must, as the Hopi Traditionalists do, immerse ourselves in Mother Earth. The put this succinctly, we need to blend with her so that we can celebrate life." 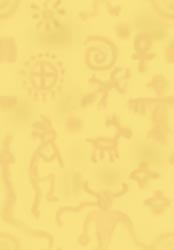 ENCAPSULATION: Ancient Ideas in Modern Times is this book explaining the ancient prophecies and way of life of the Hopi. The struggle the tradionalists have with modern dysfunction is metaphor for our human condition. The situations in Hopi land are described to be a microcosm of what is happening globally; So it happens in Hotevilla, so it does everywhere. MAIN SUBMISSION: The ancient, time -transcendent, Hopi message is the message of all time. Live Simply. Celebrate Life. Blend with The Landscape. We've evolved technologically beyond our spiritual ability. In denial many are acting like it's no big deal, there's no crisis, denying the impending, inevitable crash of this civilization. What makes a creature foul its own nest? Does the question that we might be wrong make us self destructive. In "Ishamel", by Daniel Quinn, how things came to be this way is described as the mother culture myth of man fullfilling his destiny, conquering the world, creating paradise, pulling himself out of the slime, casting mankind as the enemy of the world. If we are the pinnacle of evolution, the top, then there's no where to go but out. The fundamental flaw is we exempt ourselves from natural laws. The Hopi knew when the time was to reveal their secret. As the Elderly-elders leave, the message will remain. The Hopi message has been consistant for hundreds of years. The ancient idea was presented to the modern U.N. Amazingly these Hopi stories have survived almost a thousand years. Prophecies and Instructions released outside Hopi circles in print have now come to be on the Web. That's an amazing journey. DEEPER: We developed methods of mass destruction revealing our conscious and subconscious desire to kill ourselves. That this is tolerated as acceptable shows how archtypical the self destructive desire is. Most of us know: the difference between "good and bad", life affirming behavior and what is peaceful and what is not. We know pain. We know the sanctity of life. We all know it, but slumber. Is this an inherent code to keep our numbers down when we over do it? Many have explored these questions. Rebirthing examines the fundamental self destructive tendency humans have. Our materialism is explained as our hunter-gatherer instincts by Timothy Miller's "How to Want What You Have". Miller reveals our hunger for more as inevitable and insurmountable, but by recognized, managable. Seeking happiness in acquiring more is futile. Miller recommends a course of compassion, attention and gratitude. There are a lot of different sources for the same message. DEEPEST FOR ME: I want to succeed over the resistance in myself to be a better person. I see that like Hotevilla, what happens to the world happens to me, what happens to me happens to the world. ACCESS AND DISTRIBUTION: "The Hopi Survival Kit" by Thomas E. Mails. Published 1997, Stewart, Tabori & Chang. from the cover: "......gives us the most comprehesive account ot traditional Hopi prophecy........we are enabled to influence and survive daily pressures and perils, and to alter the pace and intensity of what will otherwise be a cataclysimisc end. We learn that one final challenge remains to be met, and that remarkably, together with the Hopi Tradionalists, everyone in the world is involved in its fullfillment." ADDITIONAL COMMENTS: We cannot change unless we survive but we will not survive unless we change. Seeking immortality, our species' responsiblity grows. Survival is following the natural law.